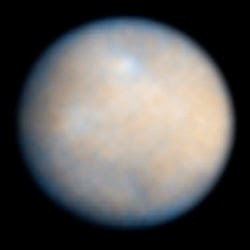 Is it irony or just poetic incongruity that at a gangly 6'4" I should devote much of 2015 working on the two missions that will be mapping the first icy 'dwarf planets' in our Solar System to be explored, Ceres and Pluto? Having spent the last 30 years using Voyager, Galileo, and Cassini images to map and understand the icy worlds orbiting the giant planets that we have visited so far, you can imagine I'm quite pleased to be involved with the first missions to explore the two largest icy worlds orbiting the Sun! In 2013 I was nominated and added as a new Science Team member to New Horizons on its way to Pluto, and then this winter asked to continue working on the Dawn Project as we approach the icy asteroid/planet Ceres. This year we achieve the first exploration of these curious but fascinating objects, but I am still struck by the fact that we are 57 years into the Space Age and we are only now getting to these two bodies, diminutive in size compared to giant Jupiter but large in stature. These are chief among a group of objects that are smaller than our Moon, orbiting the Sun, and large enough to be planetary in nature but sharing their 'orbital zone' with other similar objects. 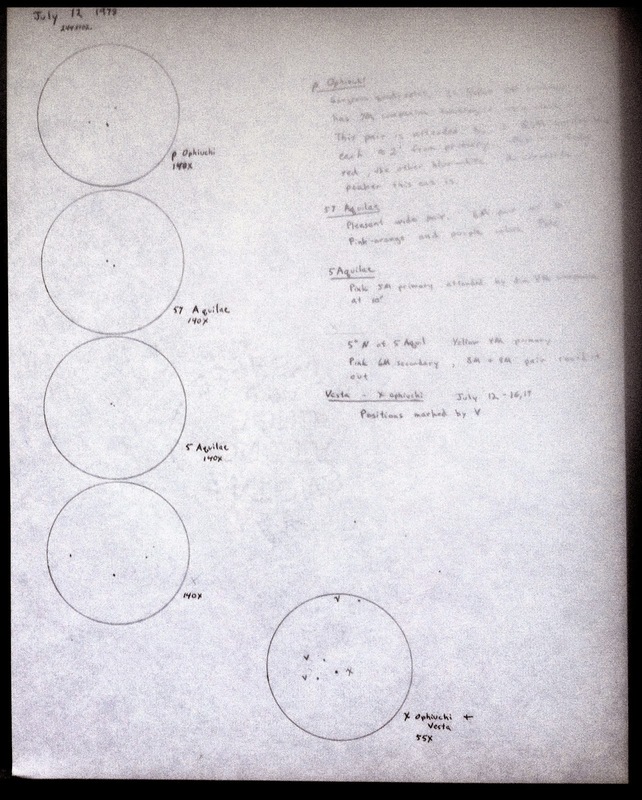 Buffalo, Summer 1978, a year out of High School and 9 months before Voyager at Jupiter. knowing it was well out of its range, hoping to record a 'Pluto-photon' on my retina. Ceres and Pluto are the dominant bodies of their two respective regions of the Solar System. Teeming with thousands of small objects, both the Asteroid Belt and the Edgeworth-Kuiper (or just plain Kuiper) Belt are key regions of our celestial neighborhood. The Asteroid Belt, home of icy Ceres which holds fully 1/3rd its total mass, is the key transition zone between the (relatively) water-poor inner planets and the water-rich outer planets. Ceres may also be carbon-rich. Kuiper Belt objects have lots of carbon-rich material and exotic ices, like the methane, nitrogen and carbon monoxide that cover Pluto's surface. This outer zone will tell us a lot about how the Solar System formed. but is ice-rich and is a transitional object. 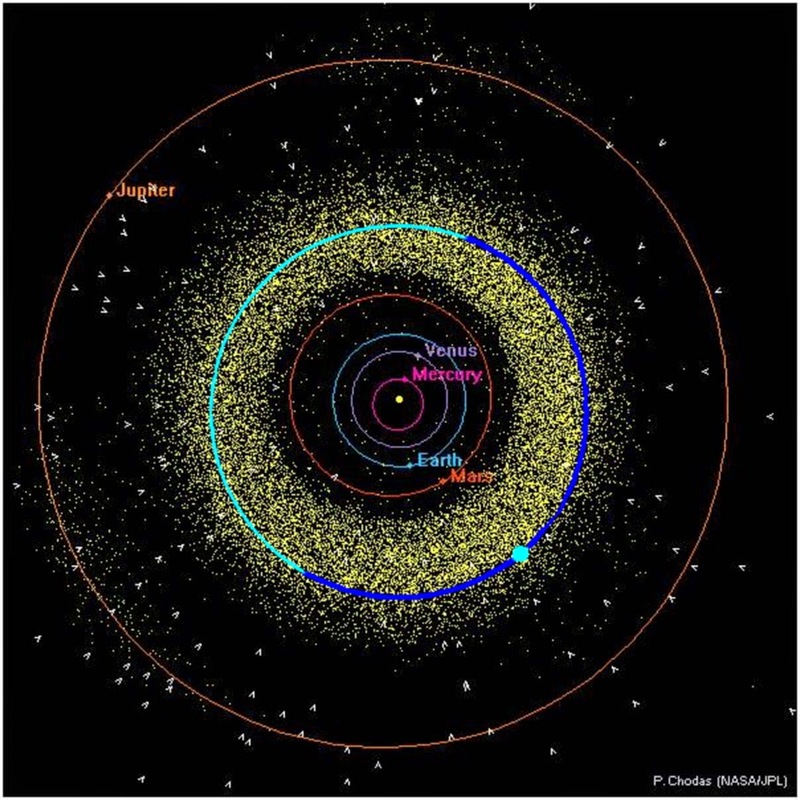 Orbit of Ceres (in blue) within the Asteroid Belt population. Asteroids visited to date, including Vesta, Dawn's mapping target in 2011. 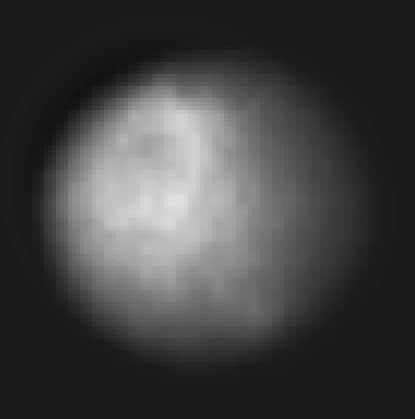 Ceres is a lot darker than Vesta, as shown here. We will be able to use Dawn imaging rather soon! The Voyager/Galileo/Cassini missions to the giant Outer (or Middle Zone?) Planets looked at their icy moons in close-up, revealing towering fault scarps, smooth ice volcanoes, impact craters flattened and 10-km-deep, disrupted ice rafts, and jets of water vapor and ice crystals venting into space (all the subject of numerous previous blogs). When Dawn and New Horizons reach their targets this year, we will see up close for the first time ice worlds not orbiting large planets but orbiting the Sun. This is a rather important distinction. We now know that gravitational tides, like the ones that affect Earth's oceans but much more powerful, can radically change an orbiting body's geologic history. This was a key discovery of the Space Age. Examples of how tidal forces change worlds include the famous volcanoes wracking Io, but also the faulted and disrupted icy shell of Europa, the complex geology and interior of Ganymede, the icy fractures and vents of Enceladus, and the volcanoes, diapirs, and geysers of Triton. All three of these icy bodies (and maybe a few more) are believed to be harboring liquid water oceans beneath their frigid surfaces. Maybe we will find evidence of the same at Ceres, Pluto or both. A key difference is that tidal forces are weak or negligible at both Ceres and Pluto. Ceres is most similar in size to several of Saturn's icy moons and may be similar internally as well, being composed of 25% water ice by mass. 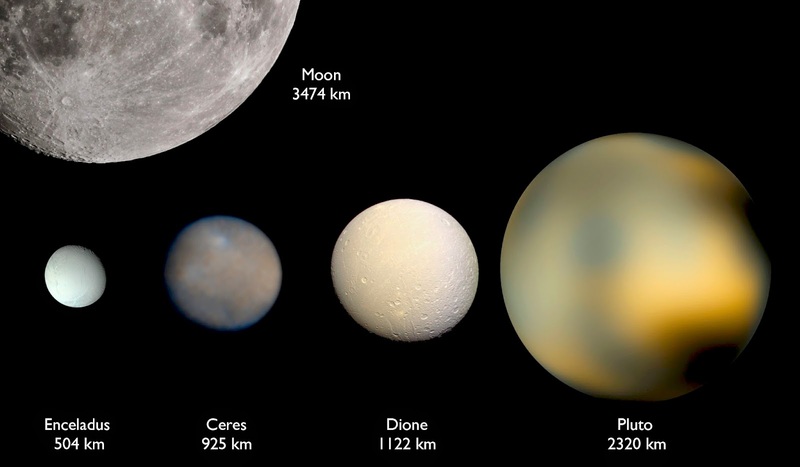 Dione is a pretty good match to Ceres, at least in basic properties of size and bulk density. Dione has signs of past geologic activity in faults and volcanic resurfacing but is not active now. One thing we have learned exploring the Solar System is to be prepared for anything. 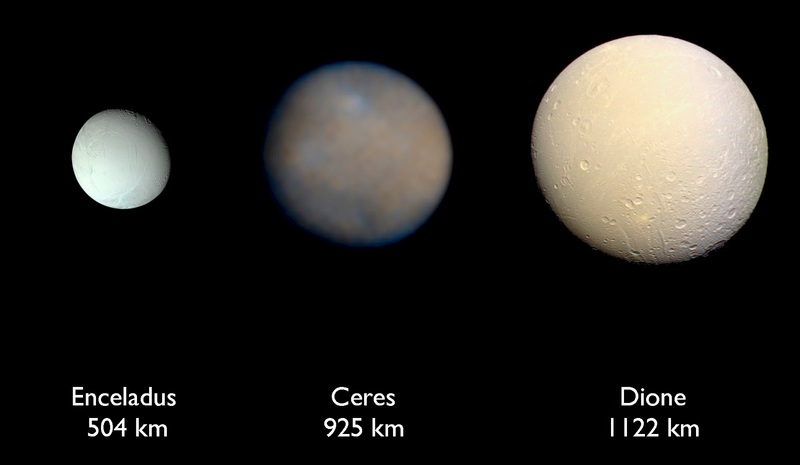 Ceres is unlikely to be another Dione, but Dione will be useful as a benchmark of comparison when we do map Ceres. 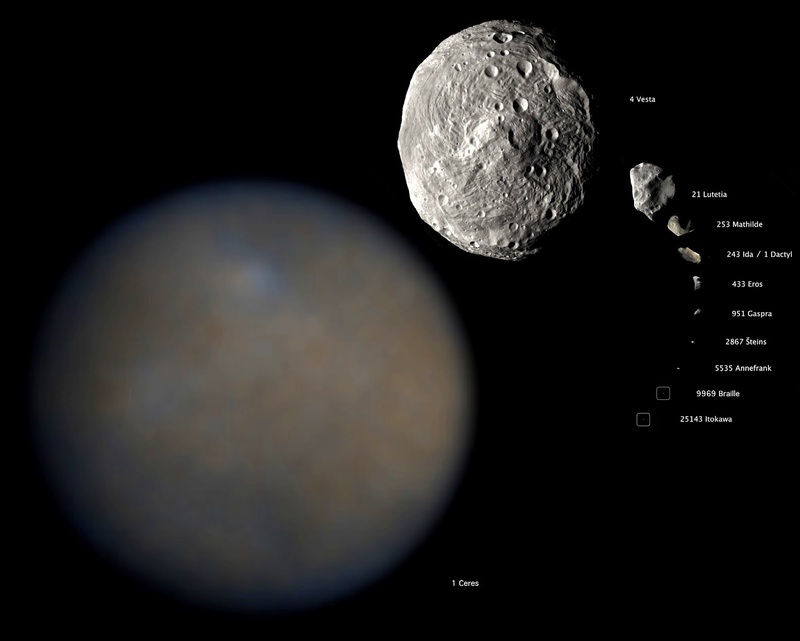 Comparisons of Ceres with other prominent icy objects. Dione is Ceres' closest twin in size and mass. Pluto and the Moon are shown above for comparison. How the limited/negligible tidal heating will affect Ceres is unknown, but Ceres is closer to the Sun and warmer than the other ice worlds. This heat combined with radioactive heating and other sources may have resulted in internal convection, surface erosion or other internal activity. Ceres also looks to be occasionally venting water vapor into space, as detected by the Herschel Space Observatory. It is theoretically plausible that Ceres may have a liquid water ocean as well. Whether the venting of water vapor is related to this ocean is unknown, and that would be rather exciting. What might be hidden within such an ocean would be even more uncertain. The first priority to to simply assess the geologic history of Ceres and to determine the origin of the venting. Is it related to volcanoes, fissures, impact craters, or just warm ice vaporizing under the heat of the Sun? It might be similar to the venting we see on Triton or Enceladus. Maybe it's something we haven't thought of or seen yet. We can only find out by mapping the geology, topography, and composition of the surface at high resolution. We are about to do just that. Dawn and New Horizons are two very different missions. I will talk more about New Horizons next month, but in short, the Pluto encounter will be more than 6 months long but will be very fast, much like the Voyager encounter with Neptune in 1989. 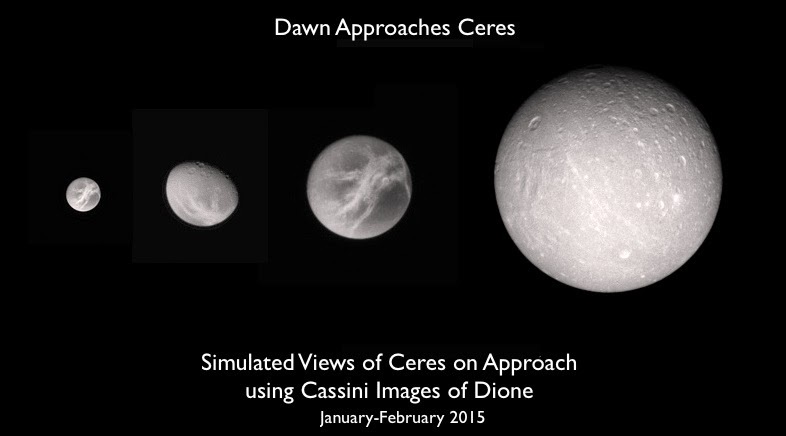 Dawn will arrive at Ceres first, beginning in January, and this approach will be quite leisurely by contrast. Orbit 'capture,' when Dawn is firmly under the gravitational influence of Ceres, will occur around March 6. Dedicated mapping operations will start some time in late April at resolutions of ~1.5 kilometer per pixel. Don’t expect lots of images during approach to Ceres, however. To reach Ceres, the spacecraft must continue ion thrusting all the way in, and we can only point the cameras when the engines are turned off for brief intervals to peak at our target. That's why we won't be seeing pictures every day! We can't actually take pictures every day and still get to our target. We should be getting a set of images once every 1-2 weeks during approach, though, and the science team and those watching with us will be most eager to see what those images tell us as we near our target. 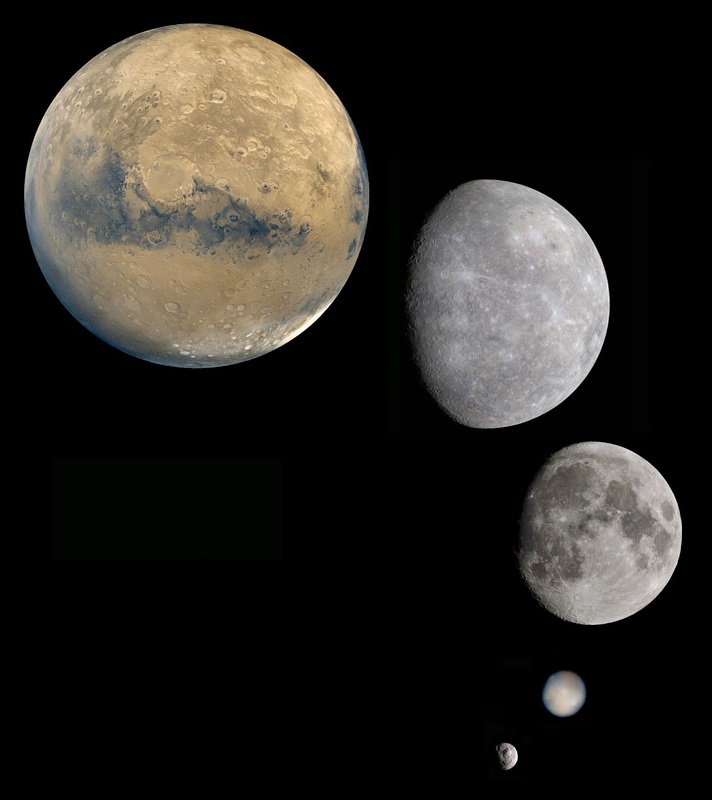 Once in orbit, we will map Ceres in stages, going down to progressively lower altitudes. Resolutions will increase from ~400 meters to 140 meters to partial mapping at 35 meters! 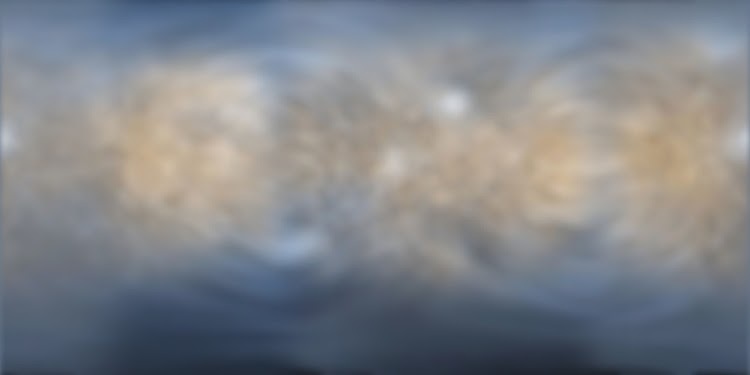 Our best map of an icy body is that for Enceladus, which has recently been completed in color at 100 meter resolution, by the author. 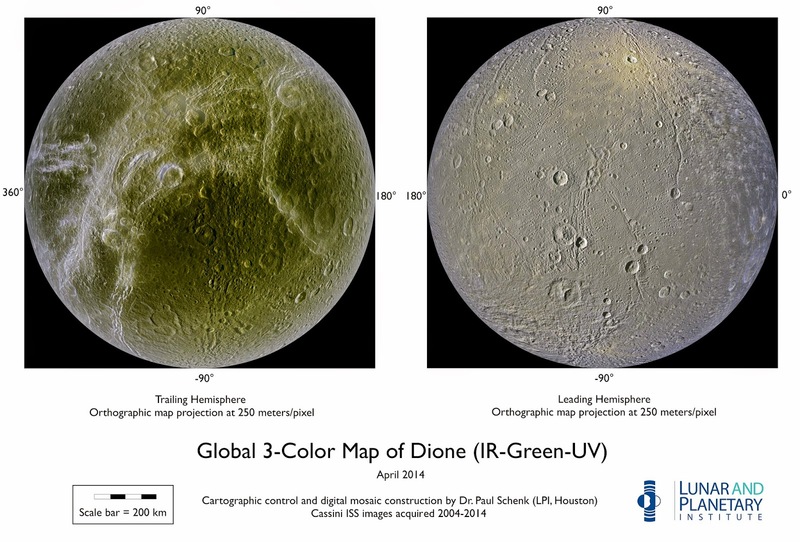 For Dione we have a similar map at 250 meter resolution. Simulated views showing the sorts of things we might see on approach to Ceres this winter. From a science perspective, I will be most interested in (and my main role) the nature of impact craters on Ceres. Impact craters record many things about a planets history and its structure. Impact craters can excavate material buried below the surface and eject it onto the surface to see. Craters also record the thermal evolution of the interiors of icy bodies. Ice can creep (that is, deform) if it is too warm, in much the way ice sheets move slowly downhill on Earth. The warmer the ice layer, the more it will flatten or 'relax.' Measuring the topography of craters will thus tell us how warm the interior has been. But first we must go there and see if any craters have indeed relaxed. Impact craters might also reveal if there is/was an ocean deep inside. For all of these questions my experience mapping impact craters on the icy satellites of Jupiter, Saturn, and Uranus will come to bear. Comparison with craters on Ganymede, Dione and other moons will be telling. Crater shape and morphology statistics for the Jovian and Saturnian moons are complete and in hand, ready for use when we map Ceres' craters! 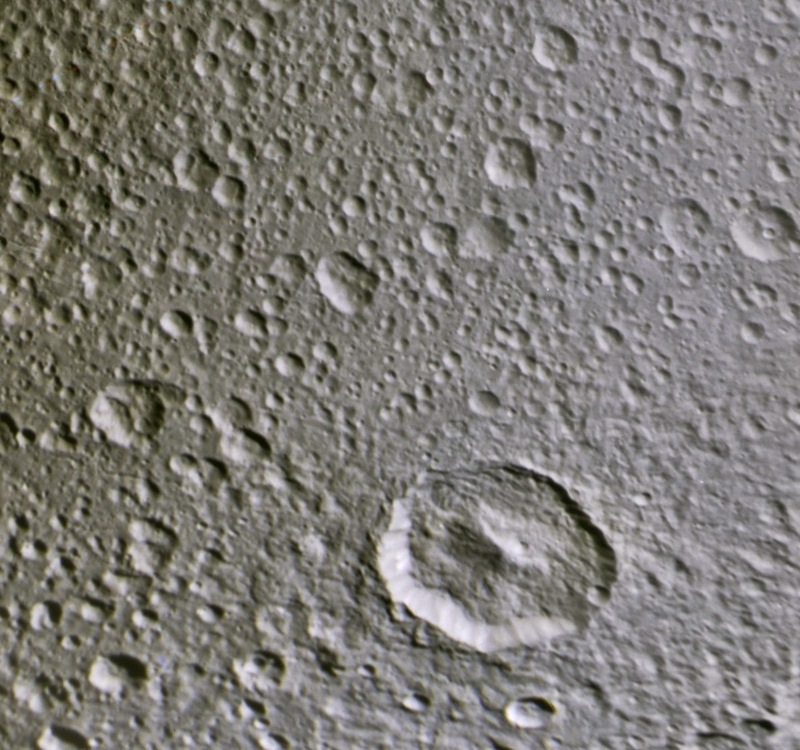 Some of the craters of Dione - the largest is 85 km wide. Craters also tell us about the population of bodies that formed them. In both cases, but Pluto and Charon especially, the sizes of the craters we see may tell us the numbers of small bodies that populate the zones both the Asteroid and Kuiper Belts. I will be assisting on this effort, too, though not leading it. Much of the crater work comes later when we have mapping orbit data in hand, but first order of business will be to survey the situation on dwarf planet 4 Ceres as we move in and assess what type of craters we see and how they have altered or been altered by the surface. A new mapped version of the HST color images, compiled by Phil Stooke. some 'bluing' at the poles, perhaps due to frost??? We don't know much about Cerean geology at this point. 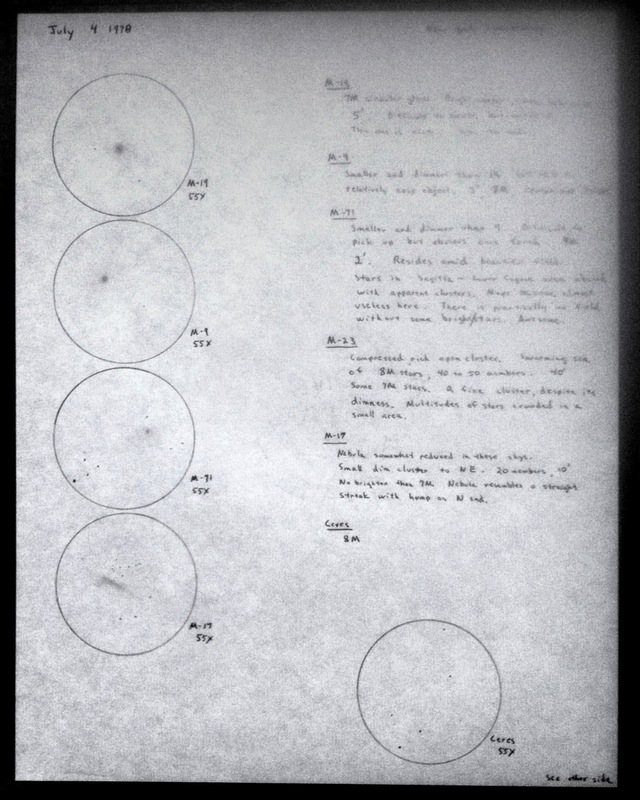 The HST and Keck images show dusky markings of various shapes, including some dark spots and a bright ring which could be impact basins. None of these features can be classified yet, however. The few bright spots might be recent impact craters, but perhaps not (they tend to be craters on icy moons). Ceres has quite an orbital inclination, almost 11°, but its axis is inclined only a few degrees, and as a result has almost no seasons. How will the affect the evolution of the surface? We don't see any obvious polar caps, but we might see some frost deposits in shadowed polar craters. Speculations among the geologists run towards craters being relaxed, and the possibility of convection in the interior, which might lead to fracturing of the surface. And of course, what is the source of true venting of water vapor? It's not nearly as vigorous as Enceladus, but the source should still be mappable on the surface. Lots to look for! HST image showing possible bright ring (between 9 and 12 o'clock). Is this an impact basin or maybe a tectonic feature like the coronae on Miranda? A future post will look at New Horizons and its encounter with Pluto this summer and its family of 5+ moons, including the relatively large Charon.